Somewhere along the way, the Mozilla UI team must have figured the best way to make things simpler was to copy Chrome. Fortunately with a key extension and some UI tweaks Firefox 4.0 can be be reconstructed :). Firstly, to what the Mozilla team did right. Despite still being drawn in XUL (which I used to loathe but now love the flexibility! ), Firefox 4.0 looks more like a Mac application. The toolbar buttons are smaller and look like Mac buttons, and the URL and search boxes respect Mac interface guidelines (square for the former, rounded for the latter). It could be attributed to a placebo effect or given I installed it from scratch, but the UI feels slightly more responsive too. It still takes more "dock bounces" to load than Safari, but less than before even with my trillions of extensions. Finally, I find this trend of remove menu bars to be extremely obnoxious, but fortunately the Linux versions didn’t follow Windows Vista/7 and Chrome’s lead! The most striking UI change is the moving of tabs above the address bar. This distressed my sister no end, but fortunately they can be moved back to where they were before by choosing View, Toolbars then unchecking Tabs on Top. 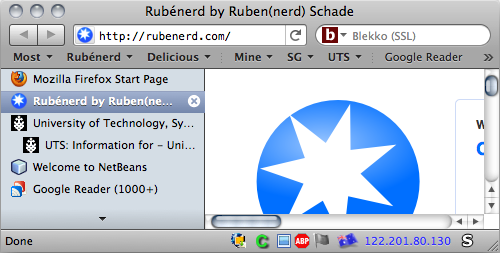 As with Chrome, Firefox no longer has a status bar. Extension icons are now relegated to an optional Extensions Bar which can be reenabled from the View, Toolbars menu. Problem is, even with this enabled we still have hovered URLs appearing in a silly transient bubble like what I’ve dubbed Chrome’s Foo-Foo bar. In my opinion, the Foo-Foo bar is a huge step backwards in usability. The solution is the Status-4-Evar extension which puts status messages back into the same readable place they were before alongside the extension icons. As an added perk, the extension also replaces the Fusion extension which never got a Firefox 4.0 update. Nice! Curiously, Firefox 4.0 doesn’t create a ./chrome/userChrome.css folder and file in your profile folder anymore, but both can be recreated and Firefox will use them.